Facebook and Instagram were down and holy moly, it was like all hell broke loose! Every FB group that I was in was panicking about this. It was a good a reminder as ever that if you don’t have one yet, it’s essential to start an email list. Whether you’re dominating Pinterest or have 100K followers on Instagram, we don’t own these platforms. But the one thing you can control is your website and your email list. Haven’t started your website yet? Check out my step-by-step tutorial here. Still, I come across so many bloggers and business owners that procrastinate starting their email list. It’s not overwhelming. I PROMISE! So let’s make it a priority for the month and start your email list now. You know you need an email list, but do you really know how valuable it can be? Here are three major reasons you should start one right now. Email Lists Are a Direct Connection to Your Reader. While you may throw up an Instagram post and “pray” at least 3% of your following sees your post, or you pay a few bucks to reach 3-8% of your Facebook fans, an email list hits your reader’s inbox. And the average open rate hovers around 20%! Email Lists Convert. Whether you’re emailing your list about your latest service or product offering or promoting your latest blog post, email lists have the highest conversion rate of any other platform. Email Lists Engage. There’s something inherently personal about an email. So while readers may be able to catch up with you on your blog or other social media channels, an email is like a behind-the-scenes peek at the action where you can share extra special info and stories just for your subscribers. I’m Ready to Start an Email List! But, What Do I Say? I hear ya. The idea of writing yet another piece of content can seem overwhelming. My suggestion is to create an email template that you follow each time and keep it simple in the beginning. That may mean that you’re only emailing a link or snippet to your latest blog post + a small personal note. Just like with your blog, you want to make sure you’re adding value in some way. Why are people on your mailing list? Because they’re getting something from you they can’t get anywhere else! Really, the sky is the limit! Just remember, instead of feeling overwhelmed, keep it simple in the beginning. For my fashion and lifestyle blog, I send out a personal note, a link to the latest posts + weekly favorites. I’ll also email sale alerts before sharing on any other social networks. Or if I’m doing something like a try-on haul, I’ll send out the link to my newsletter subscribers so they can have first dibs on the content before products sell out. For this blog, I send out a personal note, the latest post and other goodies like a weekly writing tip, helpful resources from around the web and exclusive news and offerings just for subscribers. You’re on the list too, right? If not, get on it here! Where Do I Start an Email List? So you’re ready to start an email list—yay! But there are a bajillion and one email providers out there. In the interest of being fully transparent, I am going to make my top TWO recommendations. ConvertKit was made for bloggers, friends. The features are outstanding and it makes growing and starting an email list so easy! ConvertKit allowed me to easily quadruple my email list when I took a blogging hiatus. And it lets me grow my list on autopilot. Most importantly, it’s easy to work with. I knew I wanted to create content upgrades for my blog posts to incentivize readers to opt-in to my mailing list. But signing up for all of these other services and connecitng them together + paying for #allthethings was a bit overwhelming. Instead of having to learn LeadPages or Mailmunch or how to sync it all together, ConvertKit does it all for a low price. You can create anything from a Landing Page to simple opt-in forms without any additional fees or third party plugins. It is a bit of an investment in the beginning, but it was a financial decision I decided was worth it because one of my top goals for this blog was to grow my email list. Want to demo ConvertKit? Try it FREE for 30-days with this challenge launching April! Once you’re logged into ConvertKit, this is the first screen you’ll see. You’ll be prompted to either import your mailing list from another service or create one from scratch. Once you’ve picked your journey, the first thing you’ll want to do is create a Form. A “Form” is just what ConvertKit refers to as the form people fill out to join your mailing list. What I like most about ConvertKit is that you can easily creates tons of custom forms, or opt-ins, for your email subscribers! FREE CHECKLIST TO LAUNCH YOUR EMAIL LIST! Download this free checklist to launch your email list! You'll also get weekly writing and blogging tips. Opt-in incentives are one of the most effective ways to grow your email list. Period. There are many expensive tools out there, like LeadPages, that you have to connect together to get this type of functionality. With ConvertKit, there’s no need for external paid services. You create the form right within your email service provider. Once you’ve created your first form, you’ll want to get it on your website. You can easily do so by installing the ConvertKit WordPress plugin. In the backend, enter your API key, API Secret and click on “Refresh Forms” so all of your forms that you’ve created show up. It’s fairly straightforward once you’re in. In WordPress, you’ll now easily be able to add a custom form at the end of each blog post. Just scroll down and click on the ConvertKit Form drop-down to select which one you want to appear! If you want to start an email list but don’t have the budget for ConvertKit, I recommend a free plan on Mailerlite. I recently switched from Mailchimp to Mailerlite for my other blog, and have been so happy that I did so! 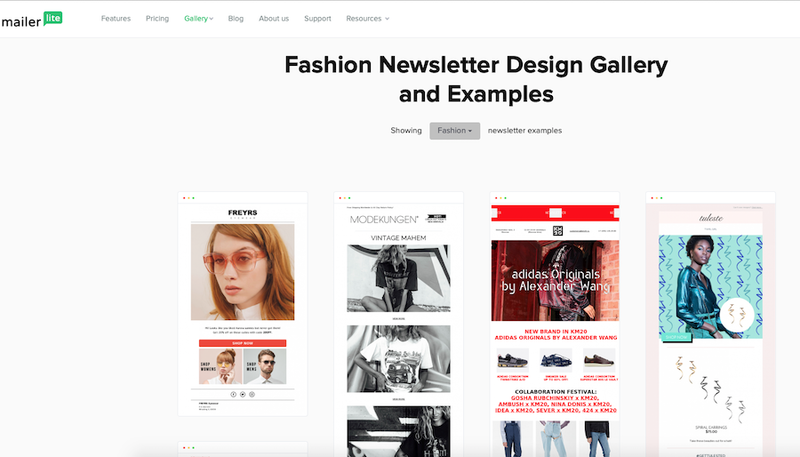 Mailerlite has a lot of similar functionalities to ConvertKit, but is totally free up to 1,000 subscribers. Once you pass 1,000 subscribers, the monthly payment is still lower than ConvertKit, and starts at just $10/month, which is super affordable. One of my favorite features of Mailerlite is they have beautiful email list templates, and it’s easy to create your own with their “blocks” feature. You can also create multiple opt-in forms like ConvertKit as well as Automations. (An automation is a sequence of emails that goes out, like a welcome series or a free e-course). Mailerlite vs. Mailchimp Which is Better? I used Mailchimp for many years and am going to be transparent in that I haven’t been with Mailerlite for very long. But the features available on Mailerlite are leaps and bounds what you have on Mailchimp. I found it really cumbersome to create pretty newsletters in Mailchimp. And it was difficult to create multiple opt-ins for different blog posts, which is really key in growing your mailing list. Plus, they are both FREE to start. Mailchimp is free for up to 2,000 subscribers while Mailerlite is free for up to the first 1,000, but $10/month equates to a Starbucks trip. It’s super affordable for all of the features it comes with. You can also create landing pages and pop-up forms. Get started with Mailerlite here. MailerLite vs. ConvertKit, Which is Better? While MailerLite has very similar features to ConvertKit, I still recommend ConvertKit as the #1 do-it-all email service provider. It has far more advanced functionality. That’s why I started out with ConvertKit to begin with, rather than work on building my email list on one service provider when I knew I would one day migrate over to ConvertKit. I didn’t want to waste my time learning about two different ESPs when I always intended to move on to ConvertKit. There are Pros and Cons to both, of course. It is far easier to customize pretty newsletters in MailerLite than ConvertKit. So if that’s important to you, that may be something to consider. But tagging users and creating Automations is more robust in ConvertKit. And it really shines in its ease of use. So you started an email list—congrats—and picked your ESP. Here are a few other things to know when you’re just starting your email list! Create a template and keep it consistent. This is the easiest way to get started with your mailing list. Create a schedule and stick to it. Just like with your blogging schedule, you’ll want to pick the same day/time of week to email subscribers! Cliff Notes: It takes less than 10 minutes to start an email list and start getting subscribers! Just pick your email list provider and then decide on what kind of content you want to send out. Create a regular schedule and start promoting that list!